When you're located in one of the country's best wine regions, it makes sense in today's climate of anything goes to collaborate with one of your neighbours for a spot of grape on grain action. And when that region is best known for its delightful cool climate Pinot Noir, why not base said collaboration around those grapes? 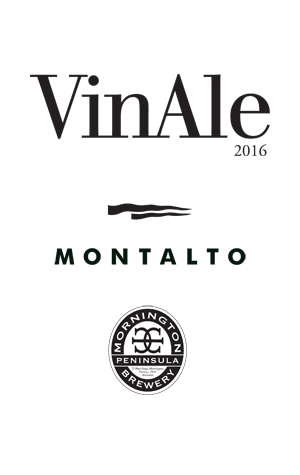 That's what happened recently on the Mornington Peninsula, where the brewery of that name hooked up with Montalto to create a beer that is the result of co-fermenting its popular Brown Ale with the winery's Pinot juice. They're calling the resulting beer-wine hybrid VinAle and tell us that this rare beast presents "crystal clear and deep burnished red in colour" with "lifted aromas of fruit, nuts and chocolate". However, it's once supped that they reckon it comes into its own. "Light sweetness runs the length of the palate supported by notes of rose and berries and toffee, finishing with a lean tartness," apparently. If you're the sort who likes to hunt down rare beers – or who reckons that sounds like the most delightful thing going – then be warned: there's just five kegs in existence, although some has been held back for a later barrel-aged release.